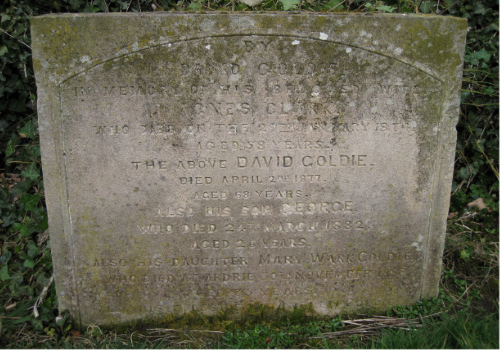 Andrew Goldie was born at the Kelburne Estate, Largs, Ayrshire, Scotland, on May 5th 1840, the first-born child of David Goldie and Agnes Clark, and was christened on the 24th of that same month. At the time of Andrew's birth, his father was the Head Gardener at the Kelburne Estate, which belonged to the Earl of Glasgow. 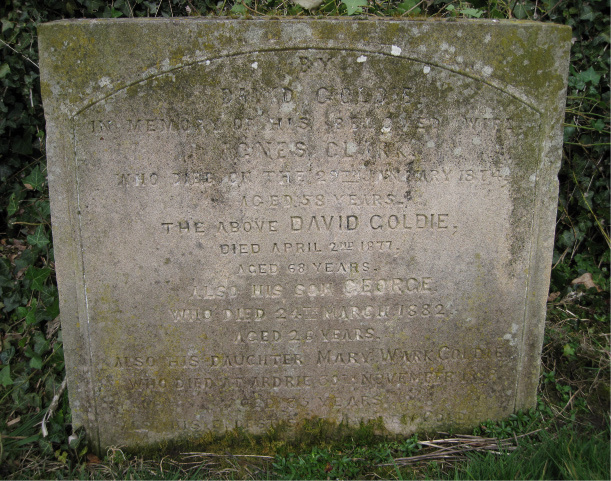 David Goldie is also reported to have been an elder in the Established (Presbyterian) Church. The 1841 census records for Largs show that David Goldie was 30 years old at that date, Agnes was 20 years old (this age was confirmed by the date on her birth certificate, even though dates on her gravestone suggest that she was only seven years her husband's junior) and Andrew is their only child, a baby of one year old. By 1851 we find the Goldies at the Garrison House on the Isle of Cumbrae which was also part of the Earl of Glasgow's estate. George Boyle had died in 1843, passing the estate to his son from his first marriage, James Carr-Boyle, who continued to reside at the Kelburne Estate in Largs. George Boyle's widow, his second wife Julia Sinclair, had removed to the Garrison House after his death and the Goldie family had relocated there also in 1845. The Goldie family grew, with Andrew's siblings in order of age: James, David, Agnes, William, Margaret, Mary Archibald, Catherine and George. By the time of the 1861 census, Andrew is to be found in Fife listed as living in Gardener's Bothie, Caputh, which is near Dunkeld. The Museum of the Cumbraes holds a document detailing Goldie's first trip to the other side of the world, to Auckland, in 1863 on the clipper ship, the Queen of Beauty. 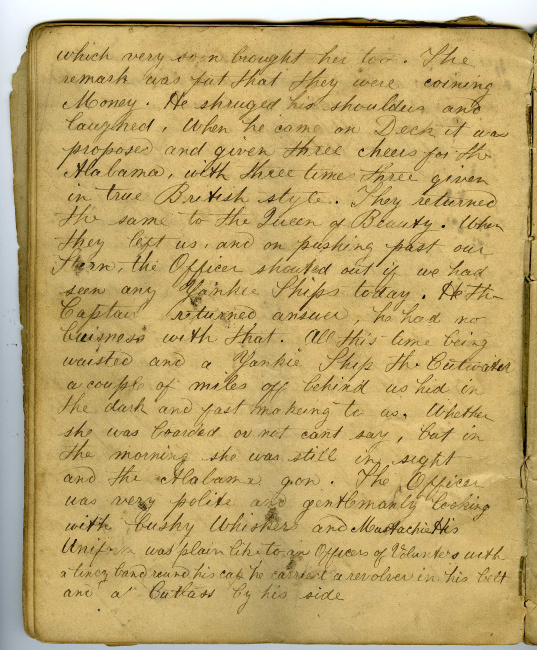 This interesting snapshot of life on board ship for the month that the travel took tells stories of stowaways, death, disease, relationships and more. Goldie stayed in New Zealand for some time. 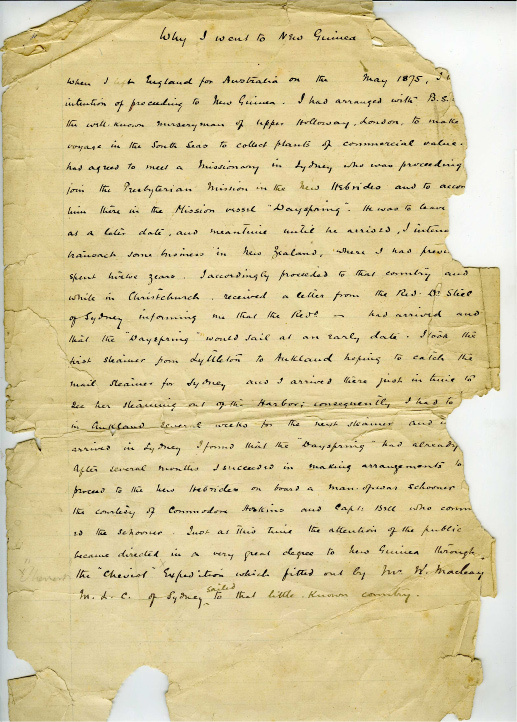 He arranged a deal in March 1875 with Benjamin Samuel Williams of Upper Holloway Nursery in London to go plant collecting and begins his adventures in Papua New Guinea, where he discovered, amongst other things, the Goldie River, Goldie's Bird of Paradise and various plants. 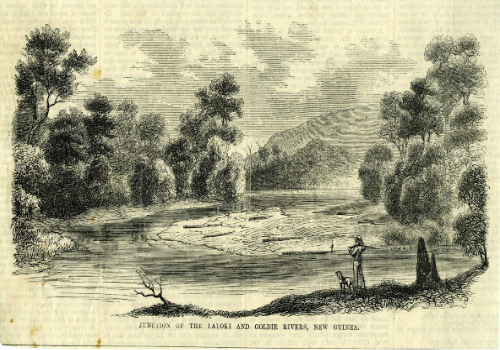 He was also partly responsible for a gold rush there, although this turned out to be false and no quantities of gold were found. 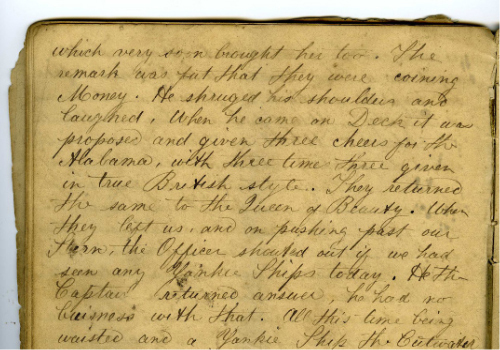 It can be seen from his writing that he took great joy in each new experience, whether that was travels, unfamiliar people and their customs, new territories or simply how to take a bath on a ship. 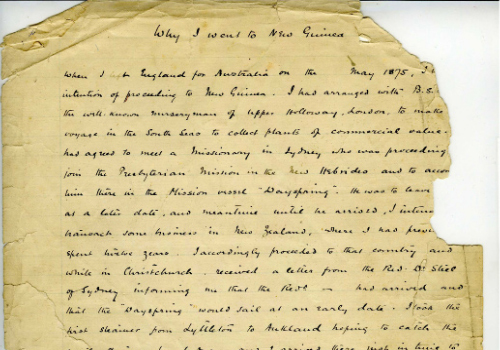 His writings, discoveries and collections have made an impact on the history of New Guinea, Australia and New Zealand as well as on the history of North Ayrshire. 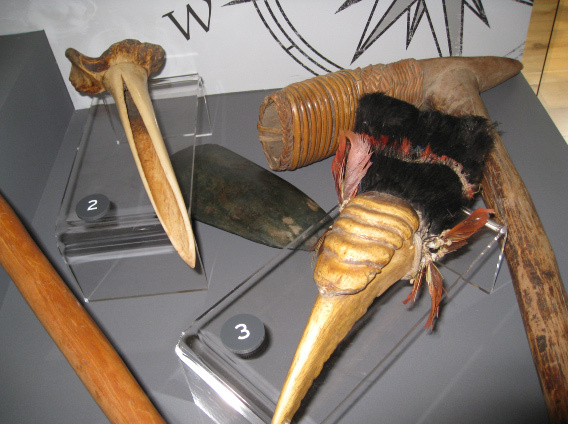 Some of the objects that Goldie brought home to his family members are on permanent display at the Museum of the Cumbraes. And the museum has been informed in the course of investigating the collection that a headdress that they care for is particularly rare, there being only 18 known examples existing in the world. 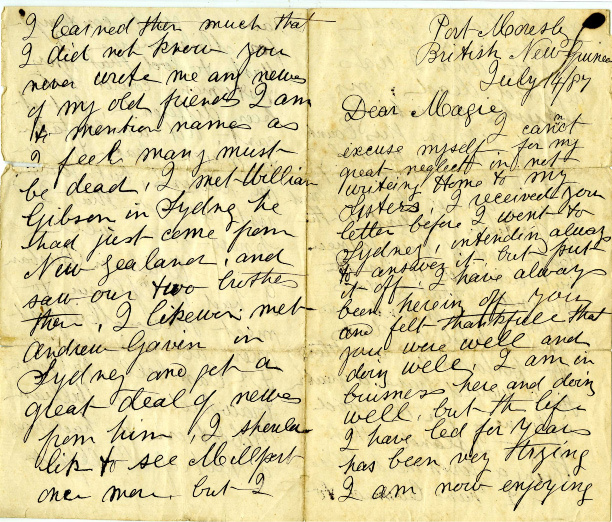 The Museum of the Cumbraes holds a handwritten memoir of Goldie's travels in New Guinea and other papers relating to his life. Although Goldie is not well known in Britain, he is considered noteworthy in Australia and New Zealand. Recently, National Museums Scotland staff have been investigating Goldie's place in the history of Pacific collections, so we may hear more soon about how the Cumbrae collection fits in with other collections around Scotland. Goldie's later life was plagued with fever and ill health, and he set up a trading store in Port Moresby, Papua New Guinea. He returned to Millport and died in Whinfield, 12 Ferry Road, his sisters' house, in 1891. His death is recorded on the family's gravestone in Kirkton Graveyard.